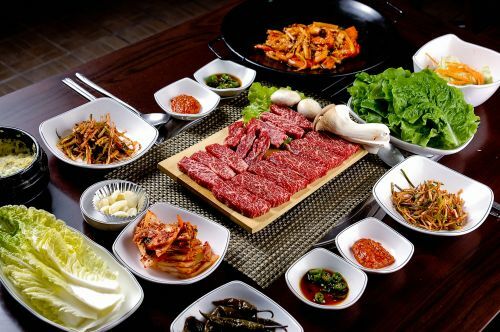 Menulog delivers for K-Town Korean BBQ House so you'll be able to track your courier on a map. Combination of steamed and fried dumplings. The authentic Korean fried chicken. Beef patty with bulgogi sauce and Korean chilli sauce. Korean fried chicken fillet with sauce. Spicy pork with Korean soy bean sauce. Spicy marinated pork in tortilla wrap with choice of sauce. Korean fried chicken in tortilla wrap with choice of sauce. Thin sliced spicy marinated pork with vegetables, chilli and kimchi. Thin sliced sweet soy marinated beef with vegetables. Spicy marinated baby octopus and pork belly with vegetables, chilli and kimchi. Spicy marinated squid and thin sliced pork with vegetables, chilli and kimchi. Vegetarian fried rice with mushroom. Fried rice with kimchi, pork, egg and assorted vegetables. Fried rice with assorted seafood, egg and vegetables. Soy sauce and chilli dressing. Sweet Korean citron and coconut oil dressing. The original Korean fried chicken sauce. Red pepper paste based hot sauce. Soy bean paste based sauce.